My hubby occasionally has cravings for chicken pie. He has been getting his pie fix from a bakery near our place. They sell a lot of very good bread and pastries. 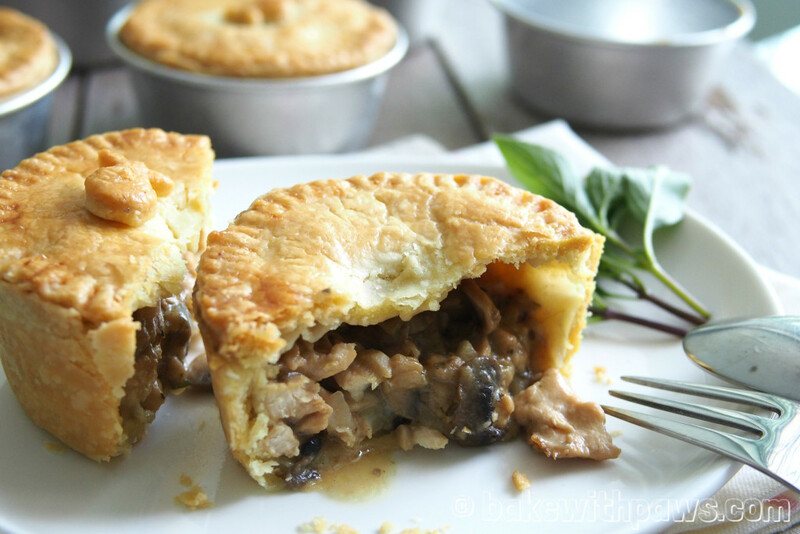 Since he likes chicken pie, I made him my version of a Chicken and Mushroom Pie. He really liked it and thought it was better than the one from the bakery. Brush the round tins with melted butter or oil. Sift the flour and salt into a large bowl. Cut in the butter until the mixture resembles coarse crumbs. Mix the water and vinegar together in a cup. Add the mixture to the crumbs. Mix together just until the dough is combined and handles well. Turn onto a lightly floured surface and knead briefly to form a smooth dough. Shape the dough into a rectangular, and wrap in plastic film. Refrigerate for at least 30 mins. In a saucepan melt the butter and add the flour, stirring with a whisk. Then add milk and stir until well combined. Keep aside. In a very large skillet, heat the olive oil, add garlic and stir fry till fragrant. Then add in onion and stir-fry for 1 minute. 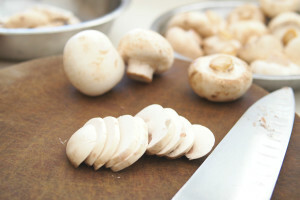 Add the mushrooms and chicken. Stir well. Pour in the chicken stock and season with salt, dried herbs and black pepper. Pour in the butter, flour and milk mixer. Simmer until chicken is cooked through. Scoop out from the skillet and keep aside. Roll out pastry into ¼ cm high sheet. Cut out six 18 cm circles and six 10 cm circles. 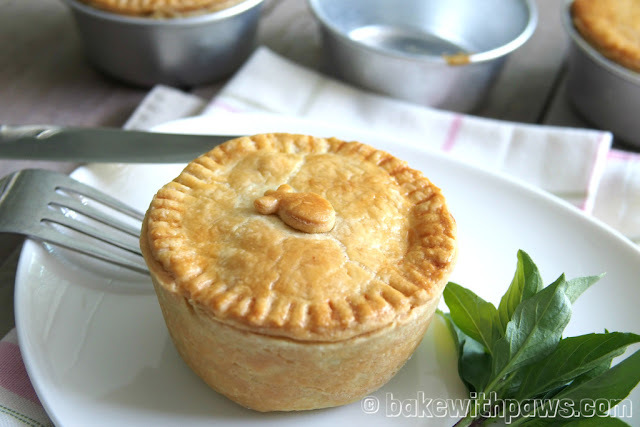 Use 18 cm pastry to line round tins with extra hanging out. Slightly press lightly to the shape of the tin used. Cut the excess dough with scissor. Fill with chicken & mushroom filling till full. 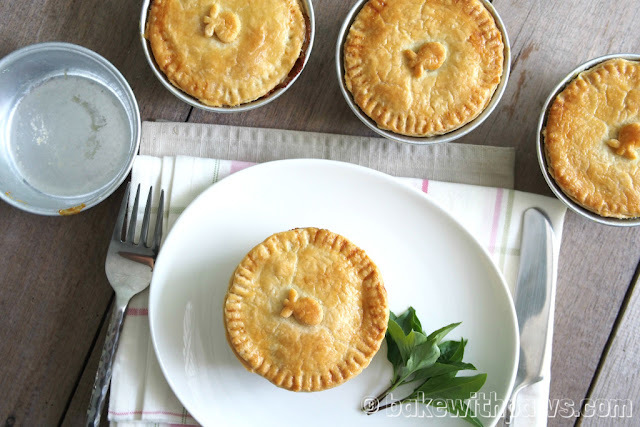 Cover each pie with a 10 cm pastry circle. Press the edges with the back of fork to join them together. Make some holes using the fork to let the steam release when baking. Brush the pies with the egg and water mixture. 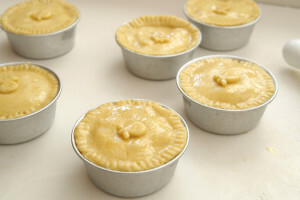 Bake in a preheated oven to 190 ° C for about 35 to 40 minutes, until the pies are golden on top. Remove from the oven and allow to cool for 15 minutes before serving. Pie lasts up to 3 or 4 days if store in the fridge with covered container.